Agriculture-diversifying the economy through agriculture and diversifying agriculture using technology. In agriculture, the state launched large scale mushroom production and training program that is already yielding great results. Many young Abians have been trained and currently engaged in mushroom production. His administration is actively supporting rice farmers, to further boost production and put more ‘Abia Rice’ in the market, with the target of producing enough to feed all Abians in 2019. Established a massive Palm plantation with over 4,000,000 tenera specie seedlings grown and sold across the state. The target is 7.5m seedlings at the end of 2019. 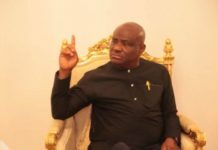 It is expected that by 2022 Abia State will no longer depend on FAAC to run as the palms and other programs are expected to diversify the economy of the state. He is funding commercial agriculture through grants and soft loans to farmers. Governor Ikpeazu provided mechanized farming equipment across the state through leasing at affordable rates; less than 50% of the previous lease cost. Commercial production of cocoa and cashew have been boosted through deliberate investment by the government. The objective is to ultimately establish processing plants for the primary products to further enhance benefits within the value chain for the cash crops. The administration is directly providing fertilizers to farmers at subsidized rates alongside other free extension services. Ikpeazu’s administration embarked on enhanced poultry and fish production with phase 1 of 100 poultry pens of 2000 birds executed. The administration constructed a 165,000 birds capacity poultry processing plant at Umuosu Nsulu in Abia central senatorial zone. Additional two units for Abia North and South are currently under construction. Following the provision of counterpart funding for FADAMA III projects, 300 young Abia farmers benefitted from N2.5m per person grant as part of the Farmpreneur project of the world bank (FADAMA). Also in partnership with the world bank, Abia commenced reactivation of the long moribund Igu Dam to ensure all year round rice production in the state. Abia State is currently in partnership with Bank of Agriculture and the federal government in the enhanced eggs production project. Education-Back to back, for 3 years Abia came first in WASCE. For the first time in Abia state, a database of unemployed Abians has been compiled and the government is taking verifiable actions to provide them with jobs, using the recently launched Abia state job portal. In partnership with Dangote group, a modern job center is under construction at Isiala Ngwa. To further enhance the capacity and productivity of Abia teachers, the administration is partnering with Australian education solution providers to retrain them and enhance teaching efficiency. More than 800 teachers have benefited from this program. A new teachers training facility has been opened at Umuahia to ensure continuous training of primary and secondary school teachers. To motivate our teachers for better performance in our schools, Governor Ikpeazu donated cars to best performing teachers from the 3 zones and also built staff quarters at Umuahia. 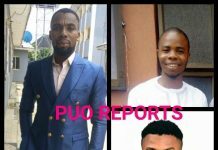 In consideration of the current socio-economic situation in the country, the government reduced tuition fees at ABSU, Abiapoly and College of Education Arochukwu to support Abia parents and guardians. Abia’s homegrown free school feeding program was launched in 2015 and currently ongoing across the state. Abia State, under Ikpeazu, is the only state in the federation providing food for primary one to six school pupils. In order to boost ICT education and stimulate interest in that area in our children from early age, Abia State launched Free ICT and Coding training for primary and secondary schools in the state using the e-library at Umuahia as hub. For the first time in Abia state, the ministry of education launched and deployed a unified education platform for all schools in the state. Results and activities of all Abia school children can be monitored from one platform for private and public schools. In fulfillment of the Governor’s electoral promise, Abia State is constructing 4 model schools (Abayi Aba, Obingwa, Umuahia and Ohafia) with nursery, primary and secondary schools in one location alongside sports facilities and teachers quarters. This we are able to execute because we paid our UBE counterpart fund of N2.8b. 359 new school classroom blocks are currently under construction in the state with more than 100 completed and ready for Commissioning. In addition, the state ministry of education renovated/constructed 67 classroom blocks across the 3 Senatorial zones of the state, sank 9 Boreholes and reticulated water supply to 43 school toilets. To support regular monitoring of schools in rural and urban areas of the state Governor Ikpeazu launched a new statewide education inspectors scheme and provided 42 motorcycles to enhance efficiency. The administration has reconstituted the state scholarship board and awarded tertiary education scholarships to best performing WASCE students in all the LGAs for 2 years. A. The Ultra modern Abia Investment House was constructed and commissioned by then Acting President Yemi Osibanjo. 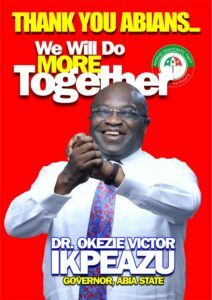 E. In Abia State, under Ikpeazu, more than 134 road projects are either completed or ongoing. 1. Kaduna Street, Umuahia North LGA. 52. Owerri road off Okigwe road Aba. 53. Chima Nwafor road Aba. 54. Abam Street, Unuahia North. 55. Awolowo road, Umuahia North. 56. Nbawsi-Umuala road, Isiala Ngwa North. 37. Reconstruction of Faulks Road, Rehabilitation and Expansion of Ifeobara Pond with 6.5km underground drainage to waterside Aba. 66. Reconstruction of Port Harcourt Road Aba, Aba North LGA, to 6-lane road with BRT lane. 69. Reconstruction of Ngwa Road Aba South LGA. 70. Reconstruction of Immaculate Avenue Umungasi Aba with spur to Kamalu road. 75. Reconstruction of Osusu road Aba. 77. Reconstruction of Uratta road Aba. 78. Construction of Ovim-Acha road in Isuikwuato LGA. 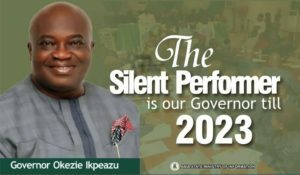 G. Ikpeazu administration introduced the use of Rigid Pavement (Cement) Technology in road construction to guarantee minimum of 30 years life span for concerned roads. Most of the roads constructed at Aba were done using this technology, following the realization, through painstaking research, that to ensure longevity of new roads at Aba there is need to ensure that all our roads are solid with double drains that empties into free flowing major drainage facilities that terminates at our already partially dredged storm water collection points. H. Governor Ikpeazu embarked on a massive desilting of drainage-ways (gutters) at Aba and partially dredged waterside river to receive more storm water and prevent flooding of roads after the usual heavy rainfall we experience for more than 8 months of the year. I. It is on record that Ikpeazu’s administration commenced the construction of the first ever Abia interchange (flyover) since the creation of the state, at Osisioma Aba. L. Recently the Abia State Government donated 40 units of 300 KVA 33/11 transformers to 40 communities in the 17 LGAs, out of 50 units procured to provide and/or boost rural and urban electrification. Efforts are at advanced stage to procure more Transformers for distribution as power is considered key to the industrialization agenda of the administration. M. Governor Ikpeazu is also working with the management team of Geometrics Limited and other power providers to ensure early roll out of affordable uninterrupted power supply across the state. The Governor recently joined the Geometrics team to visit the Cairo Headquarters of AFREXM bank to explore funding support for Geometrics operation. The administration is also at advanced stage of negotiation with other power providers. In partnership with Rural Electrification Agency of the Federal Government, more than 1000 shops at Ariaria International Market have been enjoying steady power supply on Ikpeazu’s watch as support for the growth of MSMEs in the state. The administration is currently implementing Ozuitem water scheme to provide potable water to the people of Ozuitem in Bende LGA. Work is expected to commence this month on ltem water scheme in Bende LGA awarded by the administration. As part of the administration’s efforts to reactivate moribund factories in the state, the government resuscitated the Aba Glass industry. The government is also working with the owners of Golden Guinea Breweries Umuahia, Modern Ceramics Umuahia and Enyimba hotel Aba to bring back the businesses to life. To ensure automation of shoe production processes at Aba, Governor Ikpeazu sponsored 30 Shoemakers to China to learn automated shoe production and the government is set to import modern shoemaking equipment for mass production. So far, Governor Ikpeazu has assisted Aba producers to get orders worth more than N2b in direct sales, including 50, 000 military booths, uniforms, 25,000 shoes for IDP camps, ballot boxes and others for LGA polls etc. The Government has aggressively promoted Made in Aba brands, locally and internationally, with fashion shows held in Abuja and New York City in USA. Since coming to office, Governor Ikpeazu has been the chief promoter of Made In Aba clothes and shoes which he proudly wears and market to others. As a result of the pull on demand occasioned by Governor Ikpeazu’s promotional activities, Aba shoe makers now export more than one million pairs of shoes weekly to neighboring countries. Unlike in the past, the products are proudly branded as “Made in Aba” or “Proudly Aba Made”. 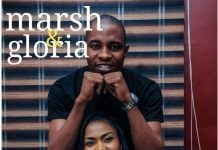 Internationally, his efforts at promoting Made in Aba brands received support from Ford Foundation who funded and launched international marketing campaigns for Made In Aba brands at zero cost to the state via CNN and other international media platforms. It was in recognition of the administration’s focused effort at promoting Made in Aba (Made In Nigeria) that the federal government signed executive order number 3 to make it compulsory for local procurement of all goods and services with locally made alternatives. A new ultra modern mechanic village at Ogbor Hill is currently under construction and expected to be completed early 2019. 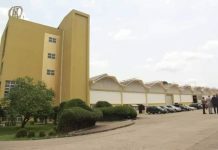 Additionally, Ikpeazu’s administration is partnering with private sector operators to construct the biggest mall in the south east for Made in Aba Products at Etche road Aba. The government, in partnership with the federal government, also launched Government enterprise empowerment program (GEEP) that provides up to N100,000 to selected Abians who are grouped in cooperative societies. So far the program has funded more than 1,000 Abians. The state is set to increase the cash amount to N100,000 per participant. In support of our young entrepreneurs, Governor Ikpeazu supported the South East Entrepreneurship Development Centre with headquarters in Umuahia, a Central Bank of Nigeria (CBN) program, with N100m take off grant. The administration has commenced the processes necessary for the establishment of Enyimba industrial city with 9300 hectares of land set aside to host the most ambitious industrialization program ever executed in the South East region of Nigeria. The project has already attracted interest of investors from China, Singapore, South Korea and Nicaragua. 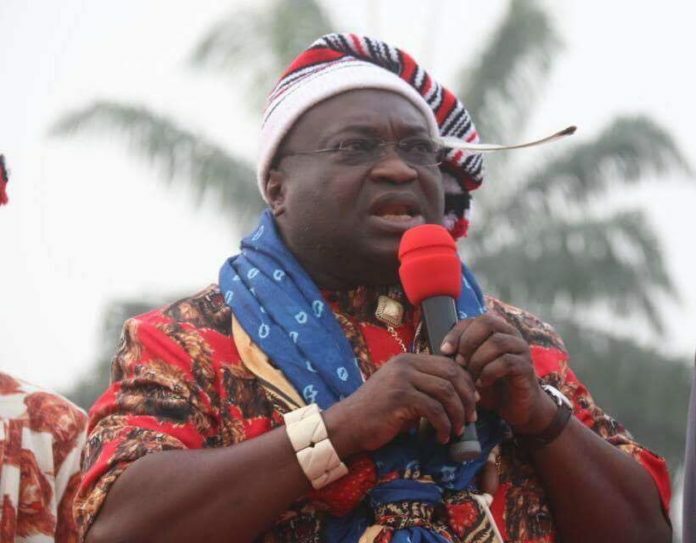 In the area of transportation, Governor Ikpeazu’s Administration trained and launched TIMAAS to enhance toad use discipline and enforce other relevant laws on sanitation and discipline. To support preservation and maintenance of public infrastructure, Governor Ikpeazu established the Abia State Public Utilities management agency (APUMA). The perennial security challenges in our state are being tackled through Governor Ikpeazu’s unflinching support to security agencies in the state, including donation of 35 vehicles that are equipped with communication gadgets for improved anti-crime operational efficiency. The aggressive policy of demolishing kidnappers properties and dens, cash for whistle blowing on kidnappers and enhancement of the local vigilante services have helped to reduce crimes and secure the state. According to a recent report by the National Bureau of Statistics (NBS), Abia state recorded the 2nd lowest crime rate in 2016. A new Security fund and a novel security card was launched by the Ikpeazu administration to support improved security of lives and properties in the state. It is also on record that Abia State was voted the most peaceful state in Nigeria with a recent report published in the Media (Vanguard Newspaper) confirming the state as recording the least number of violent deaths within the south region in the first 10 weeks of the year 2018. In the area of healthcare delivery, a number of successes have been recorded in the last three years. Abia State Emergency Medical Services (EMS) was launched in Jan 2017 to provide services across the state with initial 2 units of state of the art Intensive Care Unit fitted motorized equipment with appropriately trained staff. Service is accessed via a dedicated Toll free number 112. This service in future would be tied to the State Health Insurance Scheme and is currently supported with 5 ASPIMSS ambulances. The set is set to establish the first ever kidney transplant center in Umuahia, in collaboration with a Diaspora medical team that recently performed the first ever kidney transplant in the state. Abia implemented WHO/FMOH model of one primary health care (PHC) per political ward. Abia State now has 292 WHO recognized Primary Health Care centers (PHCs) across the state alongside Primary Healthcare under one roof (PHCUOR) which is in keeping with international best practice. Governor Ikpeazu’s deliberate actions and policies attracted the Basic Health Care Provision Fund (BHCPF) beneficiary pilot state status attracting N1.5bn (July 2017), from The World Bank following the successful hosting by Abia State in January 2017 of The 59th National Council on Health. These funds are to be applied at the 292 PHCs for qualitative services at that level of care. Abia State’s Tele-Health Initiative (ASTHI) concluded the 6 months of pilot tests in 15 PHCs and was launched in March 2018. The service has been rolled out across the whole 292 PHCs in the state to help bring life saving care to all Abia communities. It is a first of its kind in Africa. The organized private sector in Nigeria is lending support to Ikpeazu’s focused healthcare improvement effort with MTN Foundation funding 2 PHCs in their new program “what we can do together campaign” in Ikwuano and Arochukwu LGAs. Nestle Plc is collaborating with Ikpeazu’s administration in the areas of infant nutrition and maternal care services. Already, an MOU with Nestle Nutrition Institute in Africa has been signed. The first phase of capacity building training/development for our medical personnel have been concluded. It is expected to continue with the aim of further improving our health indices. Ikpeazu’s administration commissioned a General Hospital in Obingwa, complete with accommodation facilities for medical personnel. Remaining 3 new general hospitals located at Arochukwu, Ikwuano & Okeikpe are at 95% completion. In general, referral medical facilities are at a level never witnessed in the past because of the focused interventions of the Governor. Abia State also launched the first of its kind free home care services for senior citizens with vehicles provided and personnel trained to reach senior citizens in all the Senatorial zones of the state to offer care and contribute to the government’s healthcare objective of improving life expectancy above the national average. A new Mother and Child Specialist Hospital is set to open at Umuahia. In sports, Abia is the only state in Nigeria maintaining 3 top performing premier league status football teams: Enyimba FC, Abia Warriors and Abia Angels. Enyimba FC of Aba is currently playing in the continent and representing Nigeria very well. Enyimba international stadium at Aba is undergoing remodeling with Astro-turf and new stands almost completed. For the first time, toilet facilities are being constructed within the stadium for the comfort of Sports loving people of Abia State. 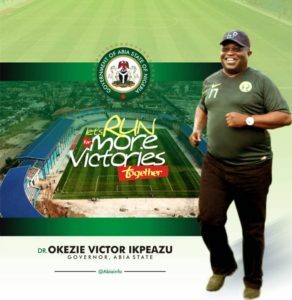 Governor Ikpeazu is aggressively re-introducing school sports to develop new talents. 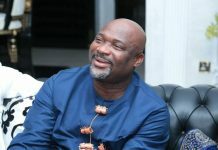 Recently, the state held the first ever ‘Abia Youths Mega Summit and rally’ that brought together young people from across the state to brainstorm and develop the framework for their participation in the development of the state. 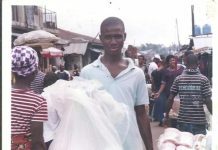 Abia Youths are trained and engaged in productive activities that sustains for life. 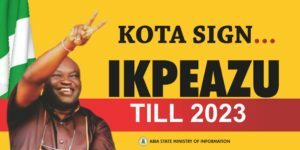 Ikpeazu’s administration is deepening democracy in the state and successfully conducted Local Government polls that produced elected officials at the 3rd tier of government. The administration has maintained transparency in its dealing with the people with the Governor regularly engaging citizens through Town Hall meetings and regular interactive radio and television programs. The administration, through the office of the wife of the Governor has built and donated 40 houses to widows in the state. In addition, more than 5,000 women across the state have received various skills training, such as tailoring/fashion designing, cake making, catering and hairdressing with working materials provided to them after training.